We all know that we should be more active. Thousands of us join the gym in January, but the dark nights and cold weather soon take their toll. What seemed like a great idea once loses its appeal and our enthusiasm goes back into hiding. Get a personal trainer! Good idea, but at prices from £30 per hour upwards, it’s not really an option for most of us. Get a workout buddy! Again, excellent idea and a top tip, but in reality it’s not always practical. Your friends may enjoy different exercises or their timetable may not be compatible with yours. What about online personal training? Excellent idea. You can get a full monthly set of fitness training workouts for a fraction of the cost. 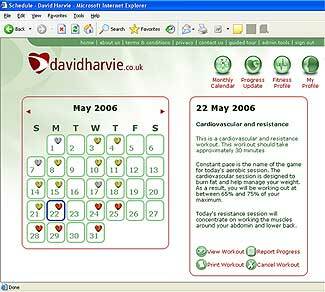 Why not try davidharvie.co.uk where you can access your workouts online via their unique calendar for only £8.95 per month. You can choose from a selection of programmes that have been designed for a specific purpose. If there’s not a programme that you like then you can contact davidharvie.co.uk and they’ll design one especially for you. The great thing about the workouts is that you exercise on the equipment that you have available. Your preferences are taken into account when the workouts are created. You can view your workouts online and print them off. You can also provide feedback so that you can see how you’re getting on.